Border stickers may no longer be the 'in' thing, but they can still be useful in creating gorgeous layouts. Give your border stickers a fresh look by placing them in middle of your page rather than restricting them to the outer edges. In this layout, I thought of them more as strips of patterned paper and was able to easily incorporate them into my page design. Give it a go and give new life to your border stickers! This layout was created using Karen Foster Cat Tracks paper, brown Bazzil cardstock, cream Bazzil cardstock, olive green cardstock and Pebbles Inc Family Tree Border stickers. Use your brown Bazzil cardstock for the background. Cut a piece of Karen Foster Cat Tracks paper measuring approximately 23cm by 30.5cm and adhere across your page approximately 4.5cm from the top. Adhere your brown leaf border sticker across your page approximately 4.5cm from the bottom. Adhere your green leaf border sticker across your page directly above it. Place a thin strip (no more than 1cm wide) of olive green cardstock down the right side of your page. 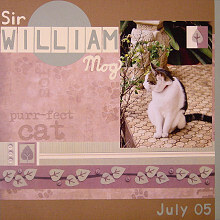 Position your photo on the right side of your page so it overlaps both your top border sticker and the brown cardstock at the top of the page. Place a leaf sticker in the top right corner of your photo. To create your title, first cut a circle from olive green cardstock. Position it half way between the left edge of your page and the right edge of your photo. Cut rectangles from cream Bazzil cardstock. The number and size of each rectangle will depend on the word you are creating. You want them to stretch right across the gap between the edge of your page and your photo. Cut your letters out of olive green cardstock and centre one on each rectangle. Adhere your rectangles in a line across your circle. To complete your title, cut the rest of your words out of cream Bazzil cardstock. Position above and below the rectangles. Finally, place the date in the bottom right corner of the page. I have cut mine out of olive green cardstock, but you could also use stickers, rub-ons, chipboard etc.